In February, we are in a segment of Ordinary Time between Christmas and the Lenten season. The liturgical color is green. Brigid’s name is also spelled Bridget and Bride. She was born near Dundalk, Louth. By legend, her father was Dubhthach, a chieftain of Leinster, and her mother Brocca, a slave. Her parents were baptized by St. Patrick. Even as a child, Brigid aspired to the consecrated life. 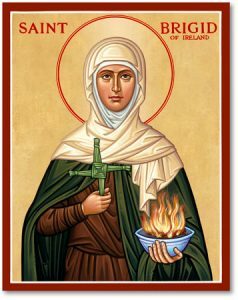 Besides Patrick himself, with whom she always held a close friendship, Brigid was mentored in her early religious life by St. Macaille of Croghan and St. Mel of Armagh. After earlier establishments under the mentorship of the latter two saints, she founded a double monastery at Kildare about 470, the first in Ireland, and was abbess of the female convent. This foundation developed a reputation for scholarship and sanctity and was the kernel of the cathedral city of Kildare. Brigid’s learning and sanctity are reflected in the numerous legends that have grown up around her. She was the inspiration of the many consecrated virgins of the Irish Church. The “Mary of the Gael,” her tomb is at Downpatrick, with Sts. Columba and Patrick, with the latter of whom she shares the title of patron of Ireland. Little reliable evidence exists regarding St. Ia. She is reported to have been a hermitess who lived in Cornwall, having been miraculously transported there from Ireland after missing travel connections with her companions. Little is known of these saints, who were brother and sister. They were reportedly murdered by Saxons near Glastonbury, England, on their way to or from Rome. Their relics were venerated at Glastonbury Abbey during the Middle Ages. This saint, also known as Voel, was either an Irishman or a Scot, who went to Gaul to preach and lived as a hermit near Soissons. An unreliable legend makes these two brothers nephews of St. Patrick who accompanied him on his return to Ireland. The two were said to be bishops, though of what sees is not certain. Mel was cleared by St. Patrick of a rumored scandalous relationship with an aunt, though Patrick ordered them to live apart. Alto was probably an Irishman. He took up the life of a hermit near Augsburg, in Germany, in about 743. Impressed by his holiness, the local Germanic king gave him a parcel of land near Altomunster, Bavaria, where he constructed a monastery. Marianus, or Muiredach mac Robartaigh, seems to have been born in Donegal. After assuming monastic garb and being ordained a priest, he and some companions departed for the Continent, apparently intending a pilgrimage to Rome. What started as a temporary stop in the diocese of Regensburg ended up being a lifelong commitment, when this band of Irish pilgrims took up residency in a double monastic community there. Marianus came into his own there as a skilled copyist and calligrapher, and a poet and theologian as well. Ludan was either a Scot or an Irishman. He used an ample inheritance to construct a hostel for travelers and the infirm, and then set out on a pilgrimage to Jerusalem. On his way home, passing through Alsace, he received an intimation of his imminent death, which was itself heralded by miraculous events. His relics were venerated in the area till they were evidently destroyed during the Thirty Years War. Modomnoc was an Irish monk who went to Wales, where he studied under St. David and also served as beekeeper for the saint’s monastic community. According to legend, he introduced bees to Ireland, when a swarm followed him there upon his return. He settled at Tibraghny, Kilkenny, and reportedly was later bishop of Ossory. Also known as Tatto, this man was an Irish monk who went to Amalbarich Abbey in Saxony, where he eventually became the abbot. He evangelized in Cleves and Flanders and was eventually a bishop in Saxony. Tanco was martyred, though accounts differ as to the circumstances of his martyrdom. Unreliable legends identify Loman as a relative of St. Patrick who accompanied him to Ireland. It is more likely that he is a 7th century bishop of Trim, about whom little is known. One of a number of sainted Fintans, this man was a monk trained by St. Columba. He led an eremetical life at Cloneenagh, eventually becoming abbot of the community which grew up around him. He was known for his gifts of prophecy and clairvoyance and had many miracles attributed to him. Finan was an Irish monk of Iona. He succeeded St. Aidan as second bishop of Lindisfarne, a diocese which at the time encompassed all of Northumbria, Durham, and York. Finan opposed the adoption of Roman liturgical practices to replace the Celtic usages. He was a friend of King Oswy of Northumbria, and did much to evangelize the kingdoms which lay to the south as well. There are a number of sainted Colmans, but this one was an Irishman and the third bishop of Lindisfarne. He reigned only three years, but his reign was a momentous one, since during it the controversy between the Celtic and Roman usages, especially over the date of Easter, came to a head in the British Isles. Reportedly, King Oswy of Northumbria sought a solution when he found, to his consternation, that members of the royal household did not agree on when to celebrate Easter. The English monastic historian Bede relates the debates at the ensuing Synod of Whitby (663), the winning argument being that the pope, as successor of Peter, had received the power of the keys, whereas the followers of St. Columba had not. Colman found that he could not accept the Roman usage, resigned his bishopric,and returned to Ireland, where he founded a monastery on Inishbofin. Rome chose not to press the issue of Easter with many of the Irish congregations, reasoning (correctly) that time would bring a resolution. –In opening the new session of the House of Representatives on January 4, new Speaker Nancy Pelosi invoked her Catholic faith. Later that day, the House, under her leadership, passed a budget bill which includes a repeal of the recently-enacted Protection of Life in Global Health Assistance Act, which prohibits NGOs from getting U.S. foreign aid funds if they promote or provide abortions. The bill would also increase funding to the UN Population Fund, which the Trump administration has defunded due to its participation in compulsory abortion and sterilization in China. President Trump has subsequently promised that he will veto any legislation which promotes abortion. –In organized delegations, as members of other local groups, and as individuals, Hibernians, including yours truly, marched in the annual March for Life in Washington, D.C., January 18. The rally on the Mall was addressed by Vice President Pence and, via video, by President Trump. During his remarks, the President stated that he will veto any pro-abortion legislation presented to him.